Well here is the Mystery Quilt top, all stitched together, with a 2" first border, just got to decide on the outer border/s and then quilt it, have a few extra H.S.T. 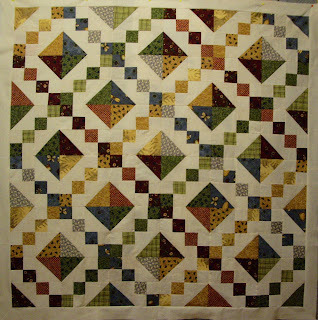 's so am thinking of turning them into quarter square triangle blocks and setting them on point for the border. Just got to finish the Black Quilt now. Hopefully I will be able to attach the borders tomorrow and then sandwich and quilt next week. Need to practice a bit more free motion quilting first though, bit nervous about that.